HESA (Hashimoto’s Encephalopathy SREAT Alliance), the Anti-NMDA Receptor Encephalitis Foundation, Inc. (Canada), Encephalitis Global, the Autoimmune Encephalitis Alliance, and the Antibody-Negative Autoimmune Encephalitis Facebook group are proud to announce that together they will present a groundbreaking symposium for physicians and medical students, to be held on April 6, 2019 at Weill Cornell Medical School, Cornell University, in New York, NY, titled: “Autoimmune Encephalitis: The Bridge Between Neurology and Psychiatry.” The symposium will be professionally filmed, and will be made available for later online viewing by the general public. 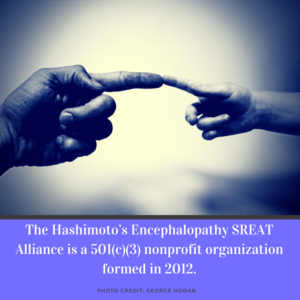 The Hashimoto’s Encephalopathy SREAT Alliance (“HESA”) is a 501(c)(3) nonprofit organization formed in 2012 to collect, archive, and share information about Hashimoto’s Encephalitis/Encephalopathy (“HE”), also known as Steroid Responsive Encephalopathy Associated with Thyroiditis (“SREAT”) with the public and medical professionals. HE is one of the sero-negative forms of Autoimmune Encephalitis/Encephalopathy (“AE”), meaning that the specific autoantibody that wreaks havoc on the brains of these AE patients has not yet been identified in the laboratory. At least 17 autoantibodies that can cause AE have been identified since 2006. HESA coordinates with other nonprofit organizations around the world, including E-Global, the Autoimmune Encephalitis Alliance,the Anti NMDA Receptor Encephalitis Foundation (Canada) and the Encephalitis Society (UK), to share scientific information, administer and contribute to online support communities for patients and their loved ones, provide speakers for relevant conferences and seminars, and generate funding for research. We appreciate your tax-deductible donations which further this vital work. As noted above, on April 6, 2019, HESA will be co-sponsoring a Symposium for medical professionals, to be held at Weill Cornell Medical School in NY, NY. The Symposium will focus on the problem of misdiagnosis that plagues AE patients because of the psychiatric symptoms that are a hallmark of the disease. This website is not a substitute for professional advice, and the content here is not intended for use in diagnosing, curing, or preventing disease. The site does not employ and is not overseen by medical professionals. Articles and studies listed here are intended solely for personal use and reference. Although you will find a great deal of information about HE/SREAT on this website, HESA cannot provide medical advice. If you have HE/SREAT, or think you may have it, consult a qualified neurologist, preferably one with experience addressing immune-mediated illness. HESA is not responsible for the contents of links to studies, their errors, omissions, or any malicious software they may contain.